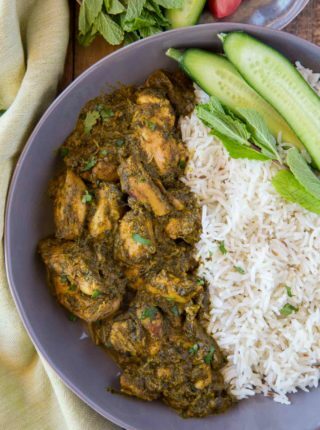 Indian Food is one of my favorite new sections on the blog, including favorite recipes like Butter Chicken, Vegetable Biryani, Chicken Tikka Masala and Easy Tandoori Chicken. Curries are so different and yet somehow they are all so comforting. I never really enjoyed them until I had graduated college but now I find I absolutely love experimenting with all different versions of curries from Chinese to Japanese to Thai to Indian. 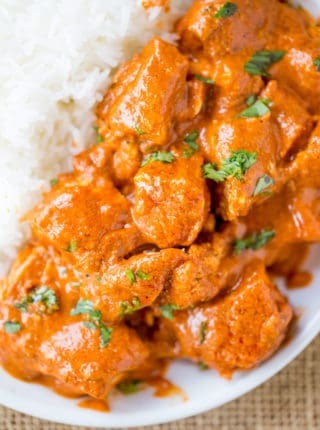 My favorite is probably Indian Curry because I love the warm flavors and I prefer the addition of heavy cream instead of the more coconut flavors of Thai curry. 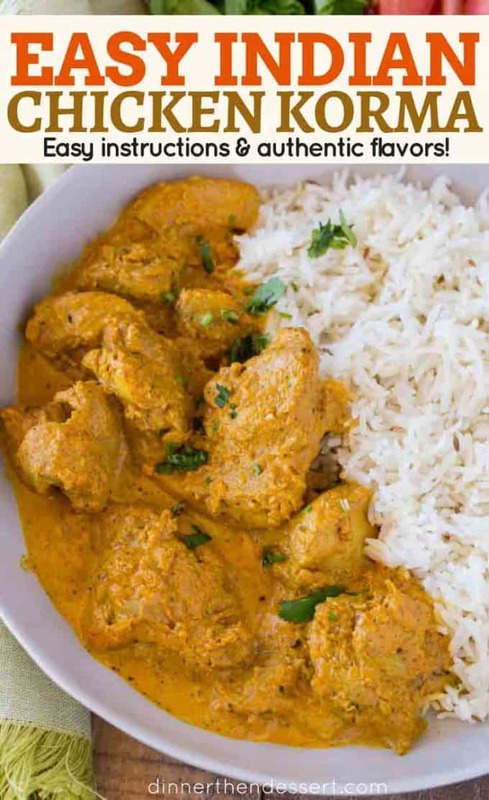 This Chicken Korma recipe is well flavored and balanced, but it is less of a punch of flavor than my favorite Indian recipe, Butter Chicken. How do you make a chicken korma? This easy Chicken Korma recipe is made using a spiced yogurt marinade, butter cooked chicken and onions that is lightened with cream. Apart from time it marinates, the curry can be made in just 45 minutes. Is a korma a curry? 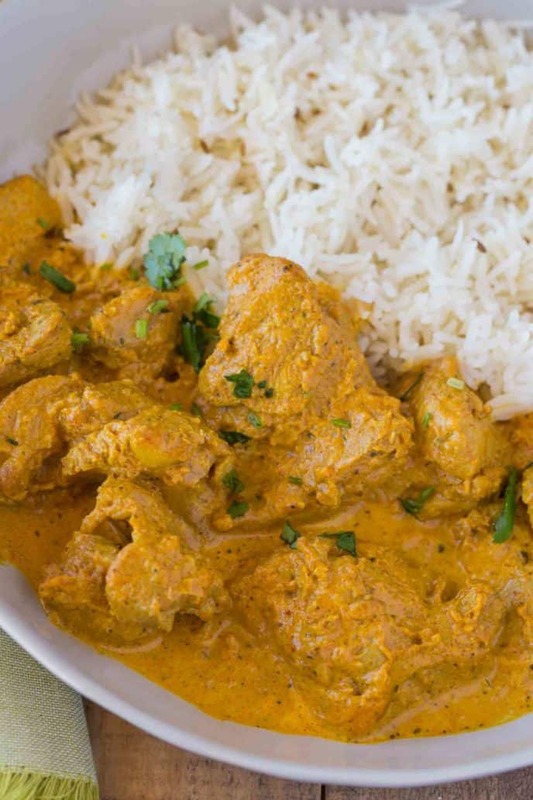 Yes, korma is an Indian Curry dish made with garam masala. What vegetables can you put in a chicken korma? The classic chicken korma recipe includes onions, garlic and ginger but red bell peppers, carrots or potatoes would work well in the dish as well as they’d complement the lighter flavors of the korma curry. 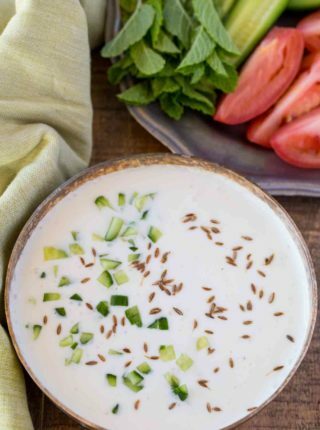 Can you substitute coconut milk? Absolutely. If you have a preference for coconut milk to heavy cream you can add it in. 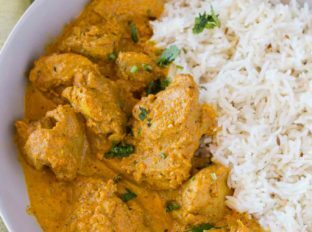 I prefer heavy cream personally for it’s richness and because it doesn’t compete with the flavors of the spices in the chicken korma. Add the spices to a dry skillet and cook on medium heat, stirring frequently until you can smell the spices. Let them cool before adding them to a covered container to use within 2 months. 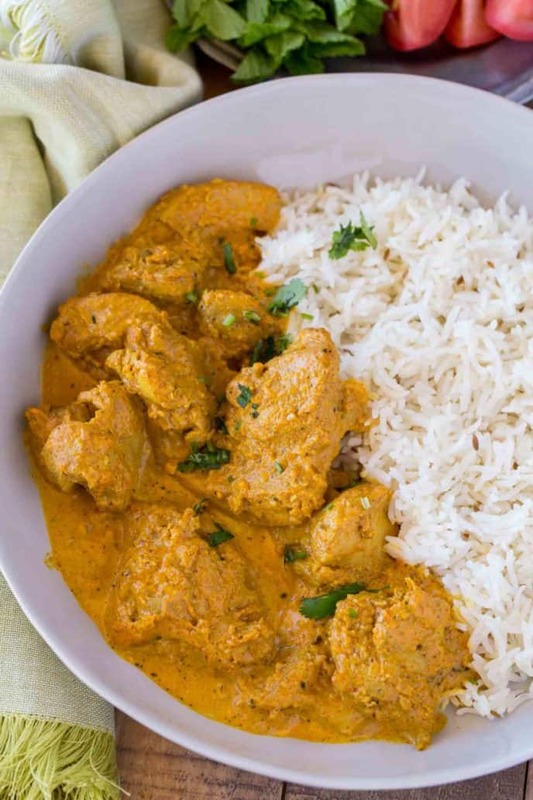 Chicken Korma is a traditional Indian dish that's light and flavorful almond curry made with tomato paste, plenty of spices and cream thats buttery and completely delicious. Cut the chicken thighs into small 1 1/2 to 2 inch chunks and put them in a large bowl. Add the mixture to the bowl with the chicken along with the yogurt and mix well. Add the canola oil and butter to a large cast iron skillet or heavy skillet on medium high heat. Add the onions and cook for 5-7 minutes, or until just caramelized. Add in the chicken and cook for 12-15 minutes or until the chicken is cooked through. Add the heavy cream to the skillet and mix well, cooking for an additional 3-4 minutes. So good! I’ve made and eaten…LOTS of korma…and this was delicious…just like some of the best restaurant versions. I’ve now made it now two ways – a couple of times with almonds as your recipe calls for…and once with 1 cup cashews instead of almonds. I loved both! So glad you love it so much, Abigael. Thanks for the 5 stars. My GF loves chicken korma and after making this recipe for her she wants to marry me. It’s definitely going into my fav recipe binder. Very straight forward and clear instructions! Not as quick as I usually like to cook (prep time was prob closer to 40 min) but I tend to be slow and careful with new dishes and the more I make it the faster it’ll go. The flavor profile however was well worth the time and effort. How awesome! So should I rename it to engagement Indian Chicken Korma?! Haha! LOVE this recipe!!! I’ve made it twice and now crave it on a regular basis. 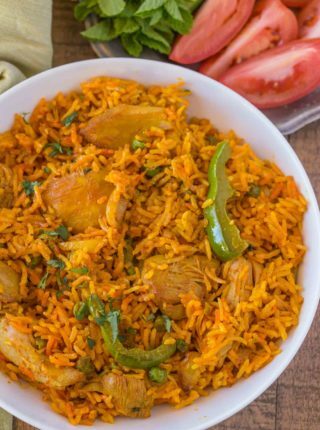 I have struggled in the past making Indian recipes flavorful but this one turns out very tasty! Thank you for the recipe! This dish came out great and was gone quickly in my household, even without the almonds (I don’t like nuts, so I skipped that part). I also used regular plain yogurt instead of greek yogurt and was very happy with how the dish turned out. I’m so glad you all enjoyed it! Thanks for coming back to let me know! made this today for my wife (I don’t eat curry’s or any spicy food) she loved it said it was better than what she buys from our local Indian restaurant. problem I see now is I know how to make another great dish. I will be asked to cook this again I know it. cheers from a happy cook. So happy she loved it! sorry to sound a little dumb when you say add chicken do you add all the ingredient (marinade and chicken) to the pan ? Yes, you’ll add it all back into the pan. Enjoy! So glad you enjoyed it, Greta! Thanks for the 5 stars! I want to cook this in my slow cooker. Any recommendations? This recipe was ok – pretty bland though, I had to add extra spices. Not very traditional either. That’s a bummer that it didn’t live up to your expectations. Yay!! I’m so glad you loved it and came back to let me know! It really means a lot! Just made this tonight for dinner. It was awesome! We loved it, this William replace my regular visit to my favourite indian restaurant. Made pesshwari rice as accompaniment. Thanks for the recipe, it’s a keeper! Made this recipe last night and it came great! Very flavorful with the right amount of spicy tingle. I marinated the chicken the night before, to cut down on day of prep time. Worked great! Thanks for the 5 stars Liz! Outstanding dish, thank you for such a rich, savory recipe! Very clear and easy to follow directions. Took me a little longer, but well worth the wait. Thanks again! This recipe is fantastic. I made it today for the first time. Both my husband (Indian heritage) and I LOVED IT. He can be fairly picky about Indian food, but he had nothing but good things to say about this dish. I loved the almond flavor (I used roasted almonds because I wasn’t sure). Super easy and very flavorful. I didn’t modify it at all—but I did add a bit more salt than yours called for. I would maybe add some cilantro to the dish next time, but it certainly doesn’t need it. Oh, and I’ll probably double the recipe so we have lots of leftovers. Oh man I love Indian food so much! This looks incredible! I have to make this for my husband! Such a gorgeous and delicious dish!! Can’t wait to try this!! Love Indian dishes! I haven’t attempted to make many dishes at home, but this is happening this weekend! I love me some indian food! Can’t wait to try this one! Me too! 🙂 I hope you enjoy it!